Flu is highly infectious illness which causes fever, headaches, aches and pains in joints and muscles with extreme tiredness. For most people it is an unpleasant and self-limiting illness. But for some groups of people it can develop into a far more serious illness leading to a hospital admission and for some people even death. Flu is caused by viruses and is caught when an infected person coughs or sneezes tiny drops of saliva. These droplets can then breathed in by other people or picked up by touching surfaces where droplets have landed. 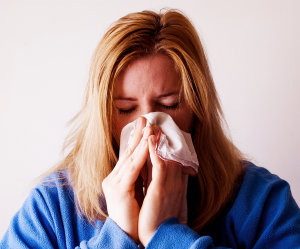 Covering your mouth and nose when you cough or sneeze and washing hands frequently helps prevent spread of flu. But the best way to avoid catching and spreading flu is having a vaccination before the flu season starts. The flu vaccine changes each year to provide the best protection against the different circulating flu strains in winter. It takes 2 weeks to receive full protection from the vaccine so it’s best to have it early. Aged 2, 3 and 4. Children aged two and three will be given the vaccination at their general practice. Children who are 4 years old are also eligible for flu vaccination provided they were 3 on 31 August 2017. These children should be offered the vaccination at their general practice. If you were vaccinated last year, you still need to get another this year. If you can get the flu vaccination for free, it’s on offer from the NHS because you need it. Don’t put it off, no matter how fit and healthy you may feel. The earlier you have it the sooner you are protected. GPs in Tameside and Glossop have now opened their flu clinics; or eligible adults can choose to go to a Participating Pharmacist instead. Make sure you get in touch with your doctor or local pharmacy to book your appointment. Most people do so don’t miss out!